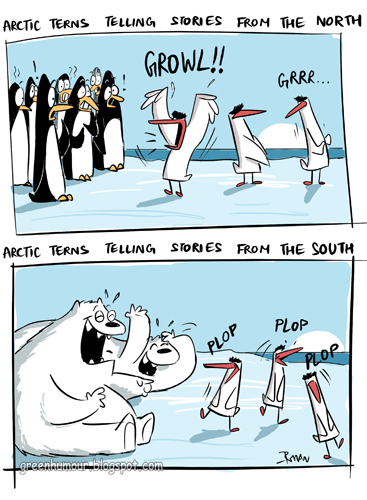 Green Humour: Arctic Tern Anecdotes- Happy World Migratory Birds' Day! Arctic Tern Anecdotes- Happy World Migratory Birds' Day! I don't think there is a better representative of migration than the Arctic Tern. To me, this is the most inspiring species ever! A bird that sees two summers every year and travelling more than 70,000 km across the globe! Here's a take on this incredible species that witnesses the best of both worlds (read poles)! And just so you know, all Green Humour cartoons are available as prints. You can send me an email to order your favourite cartoon.